I'm really excited to share swatches from a new to me brand with you today, Sayuri Nail Lacquer! 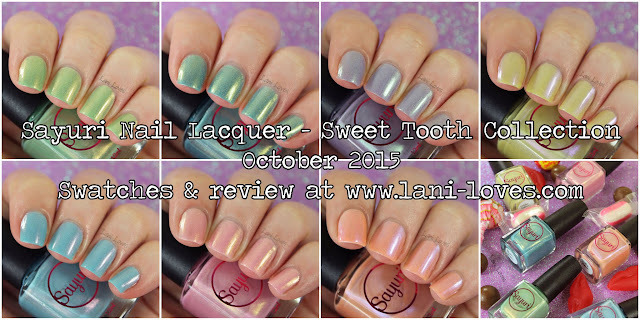 Their soon to be released Sweet Tooth collection is quite the maiden voyage, composed of scattered holo pastels with gorgeous contrasting shimmer. You may already know contrasting shimmers make my knees go weak so this collection had an easy mark in me on that count. Across the board, the Sweet Tooth collection have a really nice consistency, not too thick or thin. 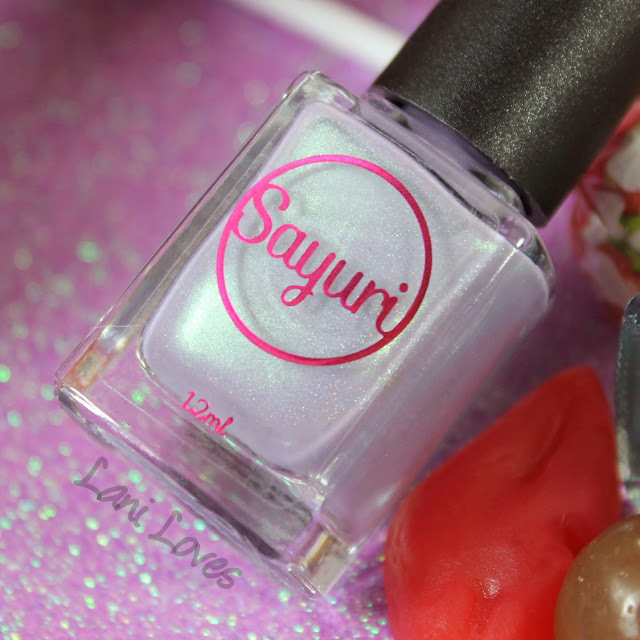 Because they're pastel and a degree of translucency is required to allow the shimmer and holo sparkle to come through, they do run on the sheer side, with all of them taking three to four coats for opacity. The contrasting shimmer is more apparent in some shades than others, but is always readily visible in differing lights. 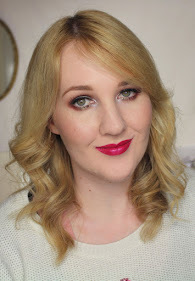 I noticed some brushstrokes in some of the more shimmery shades which may or may not bother you; it's more of a pearl effect than frostiness, so I wasn't phased. The lovely thing about nail polishes that combine duochrome and holographic finishes is that they're never lacklustre - you know those holo polishes that look incredible in the sunshine but dull as dishwater indoors? None of that here! You get the best of both worlds. A tonne of swatches after the jump! Frosted Fairycakes is baby pink with a gold shift. 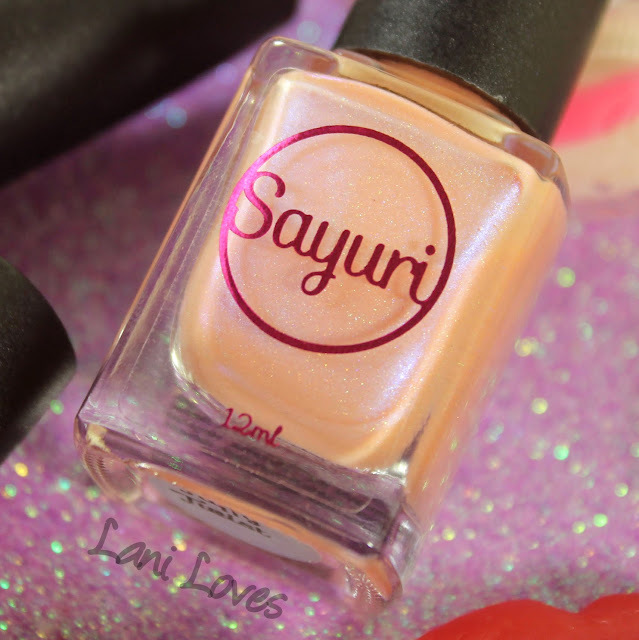 It built up easily in three coats and the gold shimmer is to die for! I think even those who aren't typically pink lovers could be won over by this one. 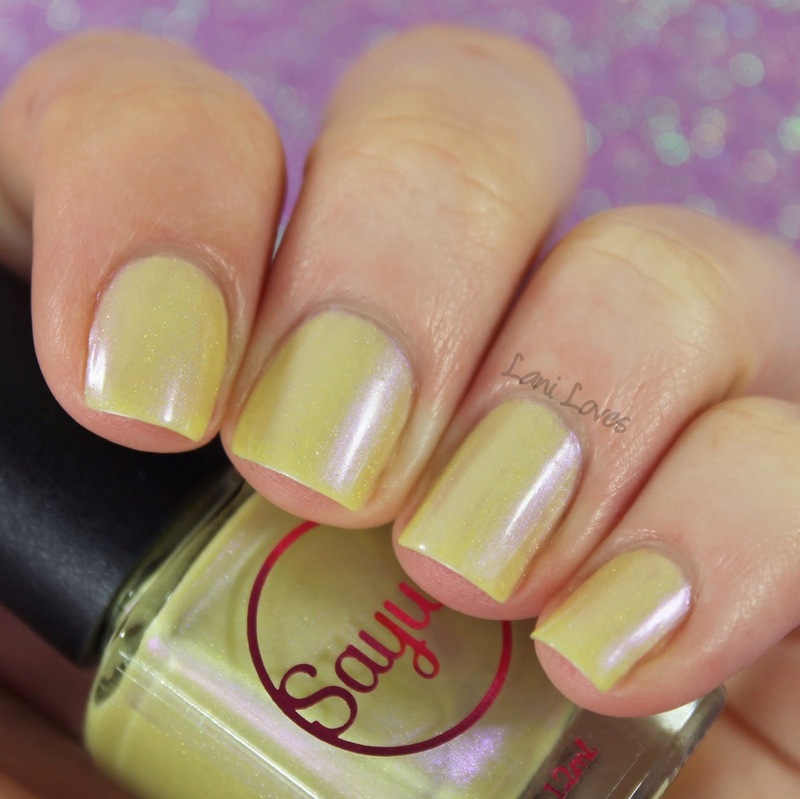 Golden Gumdrops is lemon yellow with a purple shift, a colour combination I'm really digging! I've seen yellows with pink or blue shimmer pretty often, but I've never seen purple and I definitely want to see more of it. 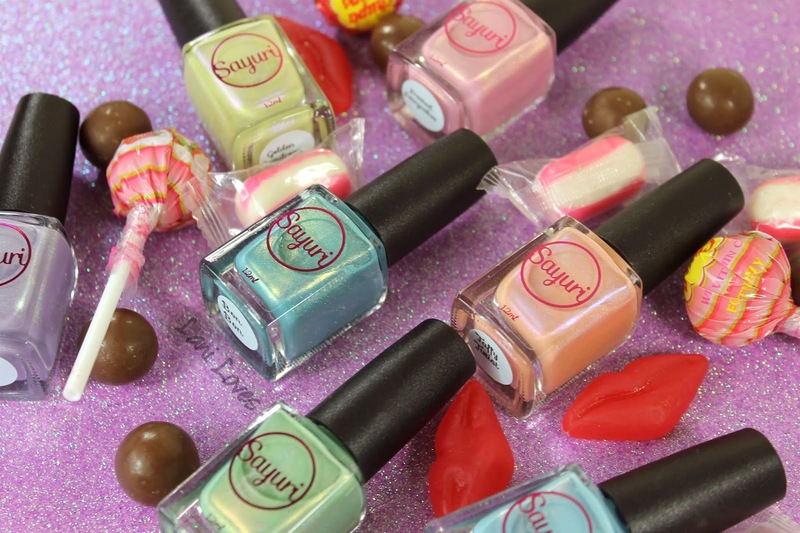 Golden Gumdrops is one of the sheerer polishes in the collection, needing four coats for opacity. You may be able to see it's still a touch streaky on my ring finger, where my nail ridges are more prominent. A good ridge filler would definitely help with this (sadly I am all out!). For this last shot I used a two point lighting set up instead of my usual three point one to better show the purple shimmer. Bon Bon is a teal with gold shift. This one is super shimmery and the holo comes through a bit more too. 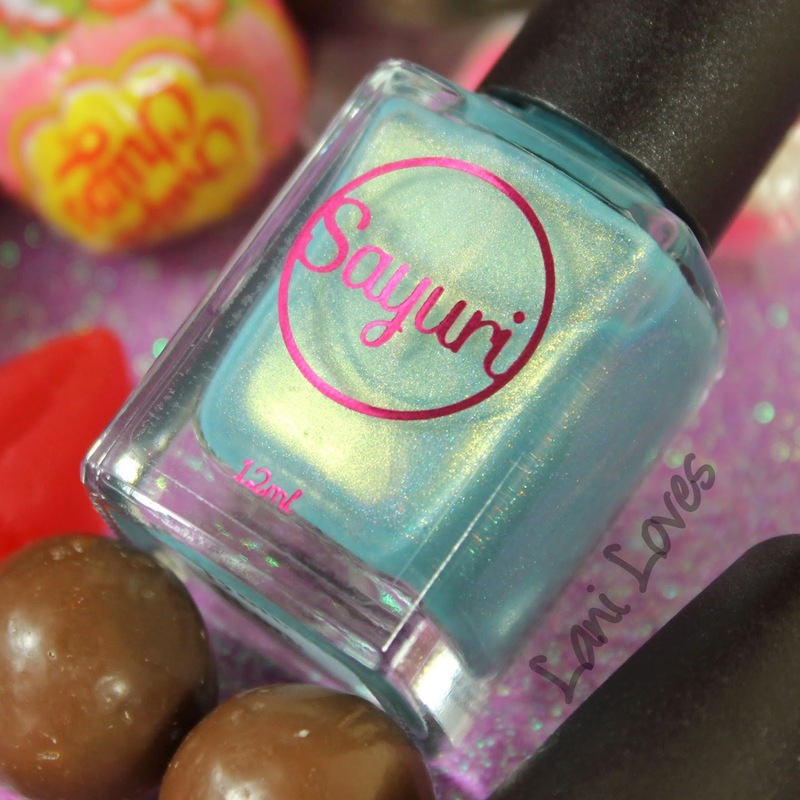 It would be the perfect base for some mermaid nails, which reminds me that I haven't done any nail art in a ridiculously long time! Taffy Twist is a soft orange with blue shift. This is another really cool, unexpected colour combination. 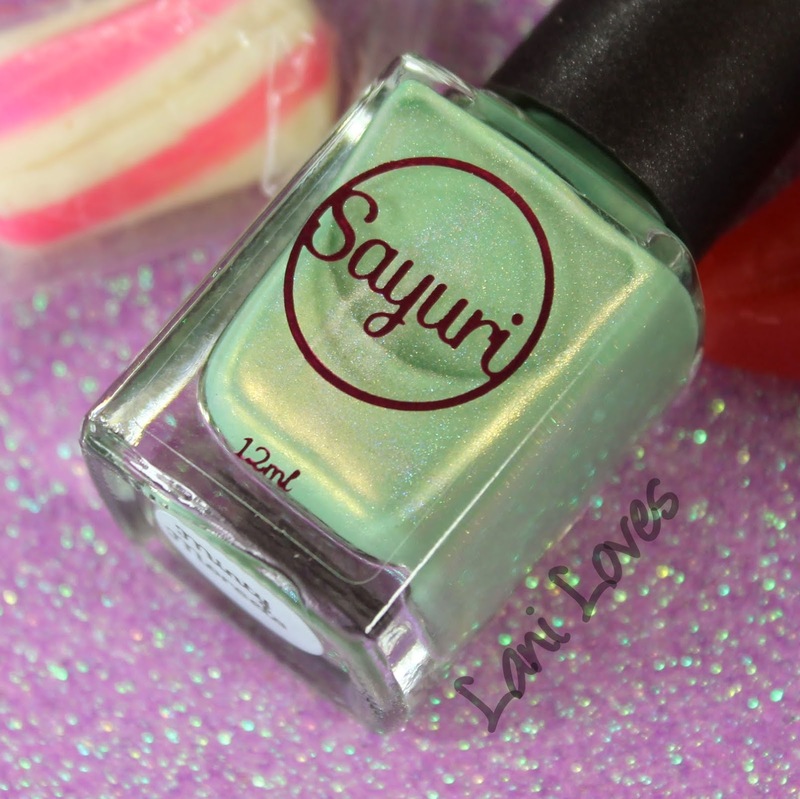 I wasn't sure how I'd feel about it in the bottle, but on the nails it's pure love! Licorice Laces is a soft purple with green shift. I like how greyed out this is, it makes it very unique in my collection and the aqua-green shimmer is the perfect compliment. For this last shot I used a two point lighting set up instead of my usual three point one to better show the green shimmer. 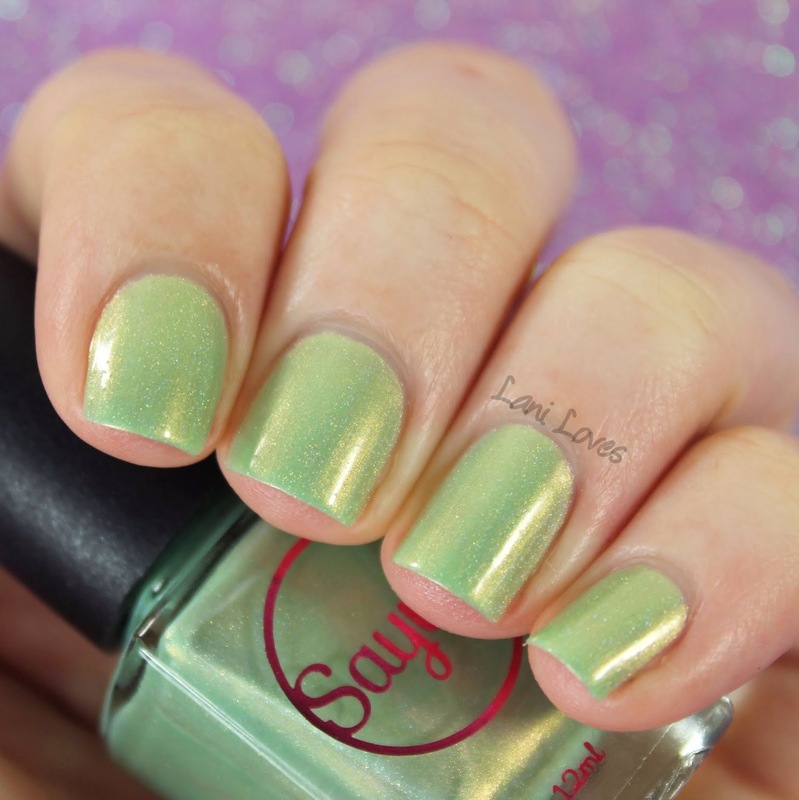 Minty Morsels is (officially) a soft green with orange shift, although the shift appears much more golden to me. Definitely my favourite in the collection and worth every coat, I'm such a sucker for green, especially minty shades like this! Cotton Candy is a baby blue with pink shift. These are some seriously gorgeous Cinderella nails right here. 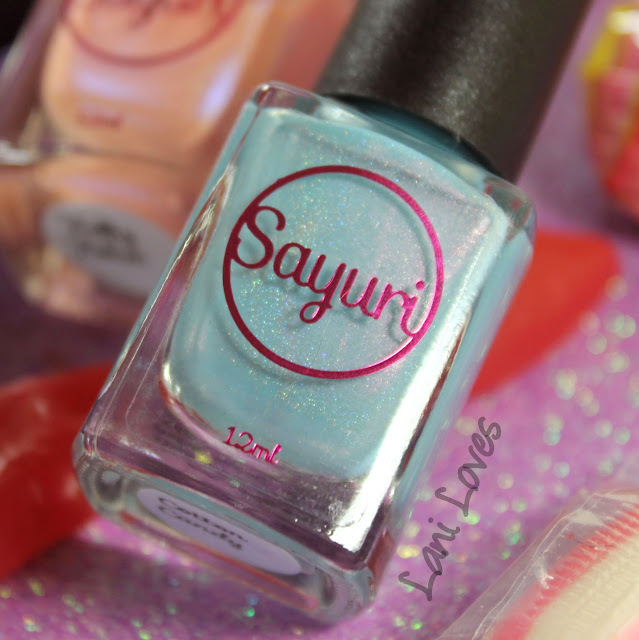 The pink shimmer in Cotton Candy is a bit more subtle than in some of the other polishes, but the scattered holo is more prevalent. Hnnnnggggh. I really like it and want to do princess nails with it. For this last shot I used a two point lighting set up instead of my usual three point one to better show the pink shimmer. 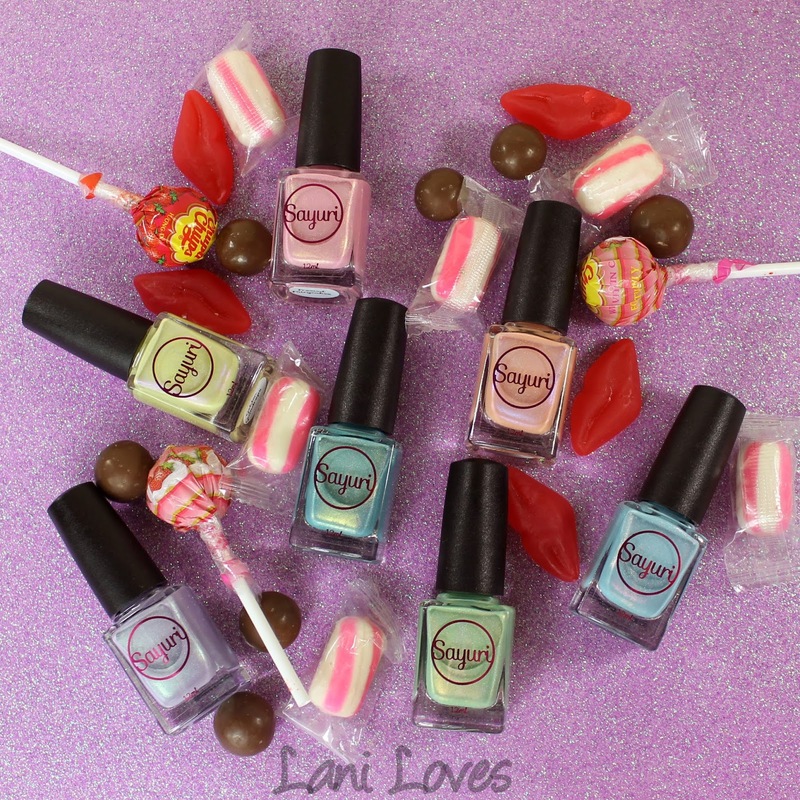 The Sweet Tooth collection launches early October and is $11.95AUD per bottle through Sayuri Nail Lacquer but will also be available in a discounted set for a limited time. 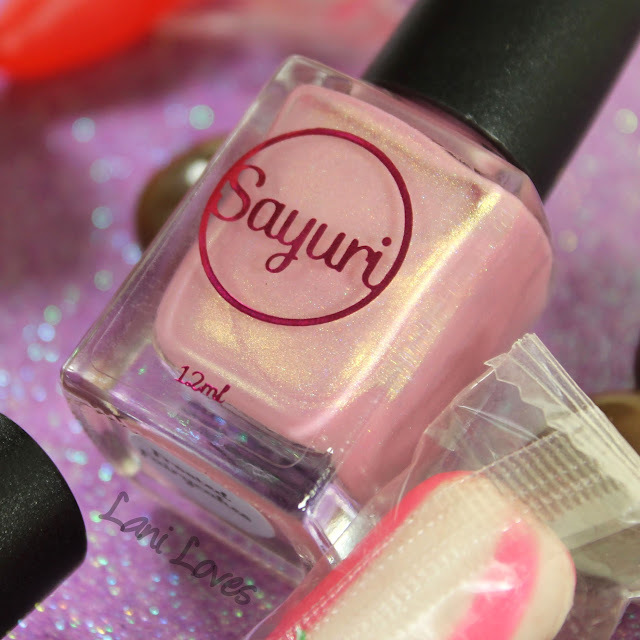 Sayuri only ship within Australia but international customers can purchase from Femme Fatale Cosmetics and Ella Ann. The collection may also soon be available from one of their other international stockists. Is anything taking your fancy from this collection? 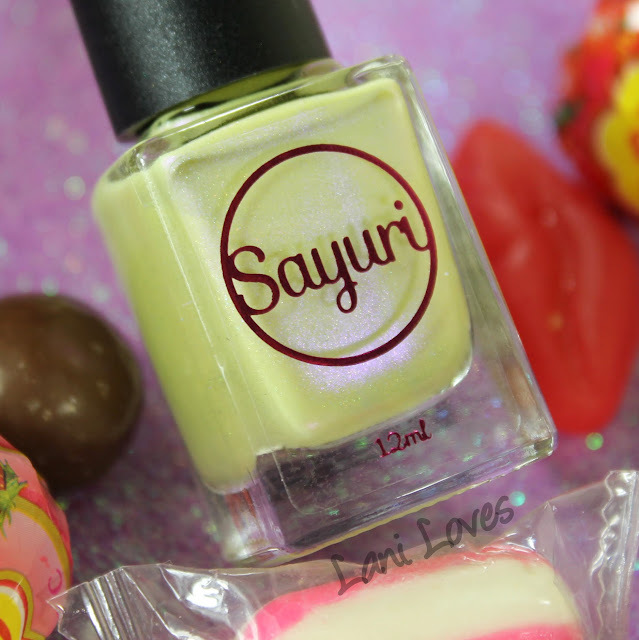 Have you tried Sayuri Nail Lacquer before? Let me know in the comments! 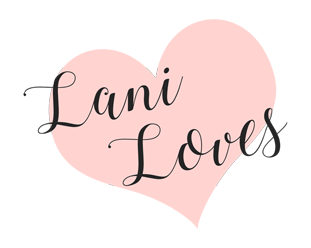 Super Last Minute Father's Day Ideas!